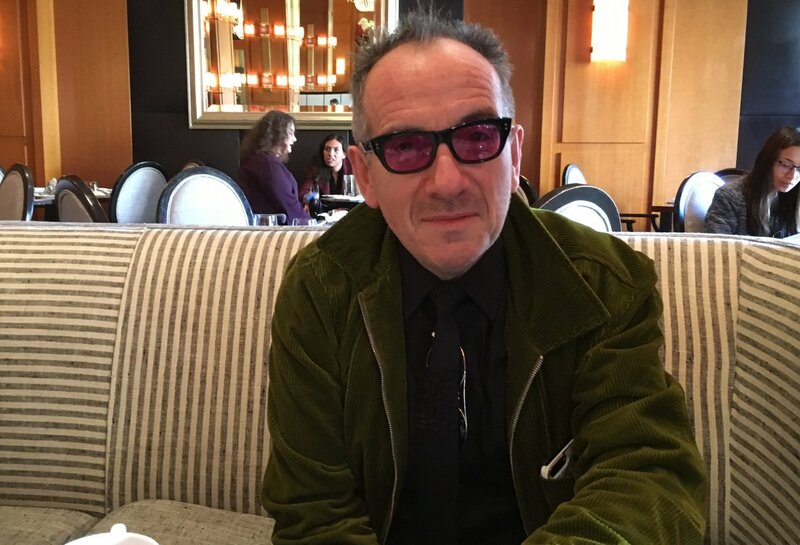 Elvis Costello has a long relationship with movie songs and one Oscar nomination behind him -- this could be his second. Pop stars write closing credit songs all the time. But the story behind Elvis Costello’s moving song “You Shouldn’t Look at Me That Way,” about an older woman’s complicated allure, is crazy. Producer Barbara Broccoli and Peter Turner went to see his show at the London Palladium and were shocked to see a photo of Gloria Grahame on the stage. When they went backstage, they asked Costello to write a song for “Film Stars Don’t Die in Liverpool,” starring Annette Bening as the aging Hollywood actress who has an affair with younger actor Peter Turner (Jamie Bell). Costello had hung out with Alan Bleasdale, the playwright of one of the plays Turner starred in during that period. But while Costello is a film buff who adores Grahame in Fritz Lang’s “Human Desire,” he had no idea about this true story. The song is inspired by a moment in the movie. Costello assembled an entire album of his movie songs, from Charles Aznavour’s “She” in “Notting Hill” to “Godfather III” and “E.T.,” called “In Motion Pictures.” And he’s prepping a Broadway stage musical version of Elia Kazan’s “A Face in the Crowd,” with Sara Ruhl, complete with 19 songs. Sadly no Oscar nom for our man. Boo hoo! The film's been overlooked in other categories too. Shame. Bunch of cloth-eared reprobates. They are pretty bad judges of films, even worse of songs. Annette Bening should also have been nominated, although Frances McDormand should win. Yeah, agree about Bening - she was superb. Streep is yet again amazing in The Post - turns out she can play basic goodness and meekness, but still make it interesting and massively watchable. Film Stars Don’t Die in Liverpool, starring Annette Bening as aging 1950s-era movie star Gloria Grahame, will hit digital and DVD April 24 from Sony Pictures Home Entertainment. The film, based on a true story by Peter Turner, follows the 1978 romance that sparked in Liverpool, England, between a young actor (Jamie Bell) and Grahame. It also stars Julie Walters and Vanessa Redgrave. Film Stars Don’t Die in Liverpool received three BAFTA Film Award nominations, including Best Leading Actress (Bening), Best Leading Actor (Bell) and Best Adapted Screenplay (Matt Greenhalgh), in addition to four British Independent Film Award nominations, including Best Actor (Bell) and Best Supporting Actress (Walters). The San Francisco Film Critics Circle and London Critics Circle Film Awards each nominated Annette Bening’s performance, with her winning Best Actress at the AARP Movies for Grownups Awards. The DVD release includes the music video for “You Shouldn’t Look at Me That Way” by Elvis Costello; film commentary with director Paul McGuigan, producer Barbara Broccoli and Turner; and four featurettes: “Elvis Costello Performance & Conversation,” “Making of the Music Video: ‘You Shouldn’t Look At Me That Way,’” “In Conversation with Annette Bening, Jamie Bell, Paul McGuigan & Peter Turner,” and “Annette Bening on Gloria. I bought the Blu-Ray. The three Elvis extra’s aren’t included in this release. I passed this cinema in Bilbao at the weekend. It is showing " Las Estrellas De Cine No Mueren En Liverpool".